A great thing about bathroom design is that you’re working with a room that’s generally closed off to the rest of the house. It’s the one space that doesn’t necessarily need to match your home’s theme, giving you leeway to be daring with its color scheme. Here are some ideas for how to do it. 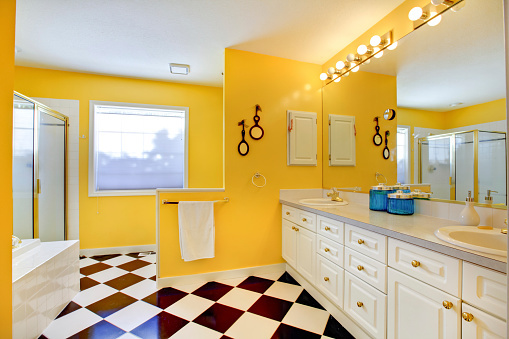 Bright yellow truly pops when utilized in a small area such as a bathroom. But the warm burst of artificial sunshine can quickly turn on you and overpower the space if you’re not careful. Never cover more than 50% of the surface area in your bathroom with yellow and stick with whites or light beiges for contrast as opposed to a second bold hue. The secret to getting away with using a truly vibrant red is to paint just one accent wall and two or three details, like an all-white bathroom with a bright red ceiling and red window & mirror frames. The same rule applies for orange. It’s surprising that turquoise isn’t a common bathroom color when you consider it’s so closely associated with water. Should you opt to “take the plunge,” pair turquoise with plenty of natural wood to complement its vitality. Go modern with faux wood flooring or eclectic with rustic, vintage furnishings. Lighter tones of green are already a bathroom staple. If you want to crank it up a notch with bolder, brighter greens, pair them with black or very dark browns. Strong colors are naturally toned down when formed into patterns, which is why vivacious wallpapers are coming back. The more neutral your fixtures and trim, the more license you have to go funky with the wallpaper. Tuscan or Spanish style mosaics are a great way to add a wealth of bright colors to your bathroom while still maintaining a classic look.